cake walk for the riders. quite a fall in a bed of poison ivy. Hope I'll OK in a couple of days. had several people vouch for me (never had that happen before). Chris and Carolynn made the trip to Columbia to participate in the SMSG Triathlon. An event which consisted of a 1/2 mile swim in a filthy body of water that Columbia calls a lake. A 21 mile bike course on what the race director calls rolling hills(i.e. hilly as hell). The Triathlon finished with a 5K run on the MKT Trail (the only thing easy about this event) All this in near 100 degree temps....After seeing the "lake", Carolynn decided that she would just use the day for training and ride the course. She saw a couple of things floating in the water and just could not bring herself to enter this body of water.....For Chris the swim was a good one, except for few off line swimmers who couldn't swim straight - a few quick jabs to the ribs got them going in the right direction. At the 12:50 mark the swim was complete. Then came the "rolling" bike course. Maintaining momentum was the key on this course. After watching several days of the Tour, Chris decided to use a very low "aero" position - that ended up working very well. A 21.89 mph average was very good on this course and resulted in Chris being one of the first bikes back to the transition area. Finally the run greated everyone. After a quick 6:30 mile, the final 2 miles (seemed more like 4 miles) were completed in a rather slow 8 min range. Due to the slow run Chris fell back to 4th place. Still rather good with the level of competition....MTB race in 2 hours - damn its hot. Chris, Mike & Rob all made the trip over to St. Louis to challenge the 1/2 Ironman & 1/4 Ironman distances. Overall everyone represented the team very well. This was Mike & Rob's first triathlon and both did exceptional.....more to come after the editor returns from FL. was riding on anger built up from his Duathalon defeat at Witchita. trail system at Crawford State National Park. Clydesdale: Gerard continued his dominance. Taking 1st place on the very demanding Weston course. Gerard now has a good points lead. Lets hope he is able to take the series title. This would be great for the team if he can. Sport 30-39 Male: David Pitt put in another strong ride to finish in 4th.....Brian Bass recovers from a little to much excess on Saturday night to take 12th.....A little mechanical problems hit Mr. Locke hard this morning, but with the help of Doug Long (thanks for the rear wheel Doug) and Gerard (thanks for helping with the front flat) he was able to race and continues getting on the podium. A 3rd place keeps him in the points chase, but he needs to win if he is going to win the series. Sport 40-49: Mike Classen, our newest member, takes the win despite getting lost on the first lap. Mike followed a competitor the wrong way during the opening lap. He quickly recovered and worked his way up to the front. 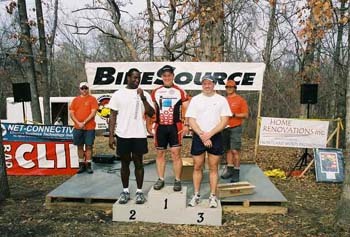 Cat 3: Ed Noll made the long trip down to Arkansas to race with the big boys. In Saturdays road race, Ed got in a 5 man break that stayed away for 35 miles. They were eventually caught. Ed finished in the pack.....Saturday evening was an uphill time trial. Suffering like the dog he is, Ed managed a top 20 placing.....Sundays Criterium was very unlucky for Ed. The pace was so high (or that he can't mount a tubular tire) that Ed rolled one of his tires off. A crash on the last lap while sprinting for the win brought an end to Ed's day. Master's 35 +: What a great day for racing. A wonderful 52 mile course that had some very challenging climbs and a few dogs to help pickup the pace only added to the fun. Chris learned two lessons today: 1. Stick to the Cat 4's. The Masters's has some Cat 2'/3's that are very good. 2. Don't run before a 52 mile road race.... An early breakaway that contained Bruce Tanner, Eric Struckhof & Tony Smith to name a few got away early. The chase group tried to close the gap, but was unsuccessfull. Pace was still very hard and remained high for the entire race.... Chris ended up getting a cramp on the final climb and ended up a disappointing 13th. Still it was a good workout for his upcoming 1/2 Iroman triathlon. It was storming Saturday morning. Between 35-40 runners braved Saturdays showers to partake in the Spring for Safety Run. At the gun, I tucked in behind the lead hoping he wouldnt make a move too early in the race. We passed through our first mile in a fairly comfortable 5:45 with the first half-mile being downhill. I knew the last half would be hard to I surged hard just second we passed the turn around cone. I gained the advantage and moved into first place. I kept pushing knowing that I soon would be approaching a difficult half-mile climb to the finish. With the rain pouring, I drove hard on the climb feeling my lungs wanted to burst, and my arms feeling like lead. I approached the finishlooked back and crossed, winning with a time of 18:18. Second place finished about a minute back. That race was definitely one for the mountain bikers. Clydesdale: With very large fields, due to rider coming from several states, Gerard new he needed to dig down deep to regain his points lead (that he lost the previous day). His teammate suggested he try a Red Bull energy drink. With his new "wings" Gerard was able to regain the points lead with a 1st place finish. Sport (25 - 29): Micheal Taylor almost didn't get to race today. Some pre-race bike tuning almost rendered his bike unrideable. He was able to get everything working and put in strong ride. Sport (30 - 39): David Pitt and Chris lined up to battle each other. Chris got another holeshot, but was passed before the single track. David got off to a poor start and had to fight his way up to the leaders. Positions changed quite a few times during the last half of the race. 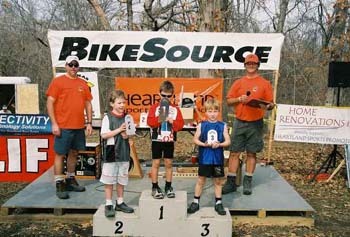 David rode strong to finish 4th in this first mountain bike race of the season (first Sport class race also). Chris didn't have his legs today by held on to take the final podium spot in 3rd. Sport (30-39): Damian Almanza and John Oberrieder made the trip down to Noesho to compete in Sundays 3rd round of the Fat Tire series. Damian took the class win with John having his best finish of the year - a 5th place. Cat 1/2/3's: It was a hard days work for our Mr. Noll. He worked hard and got in a small break with Steve Rouff & Shadd Smith. Ed and Steve did most of the work to keep the group away. Mr Smith took advantage of this and was able to take the win. A 3rd place by Ed is a very impressive finish - racing with Cat 1's & 2's is very hard. Sport Men (30 - 39): The top mountain bike riders in the Midwest lined up today for 18 miles pain and suffering on some of the best singletrack that this part of the country as to offer. Chris got of to a good start and was soon in the lead. 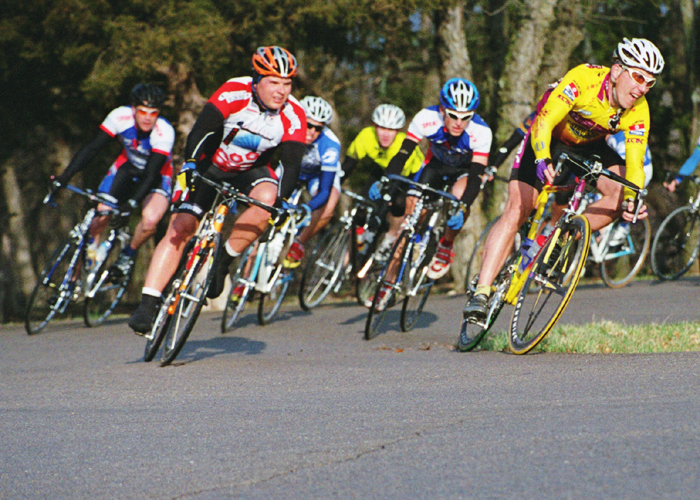 This was a mass start event, so it was very difficult for the first 1/4 of the race. Mr. Locke made a small mistake and tried to keep up with all the Pro and Expert riders for most of the race. With about 6 miles to go, fatigue set in and he was not able to answer the push by the now leader. A 2nd place finish was good for the points series. Clydesdale: Gerard got off to a good start also and held the lead for most of the race. Late race fatigue also got the best of him. A 4th place was his reward for handing in there until the end. Gerard promised things would be different in Sunday's event. All Cat's: In this unique event, the slower riders start first - Juniors, Women, Cat 5 and so on. Ed and Rob worked together once the 1/2/3's caught the leading pack. Ed did very well to place 5th in the fun event. The team looks forward to this weekends Bunny Chase. I don't know how Dave did in the prologue yesterday, but in our cat V crit here's the rundown. I led out for most of the race. I stayed back for the 1st sprint lap and then pressed it on the winners of the sprint. I took second on the second sprint lap.Dave helped lead me out for the next lap and a half where I made a move just after entering the chicane. I took the lead and picked up the pace toward the finish. I got passed right before the final sprint by Mike Palitto and almost got passed again as I couldn't find my big gear, but managed to pull off second place. This was the most competitive cat V field we've had yet. Dave really helped me out by pulling for me on the last lap and a half when I was recovering from the second sprint. He deserves credit. Sport 30 - 39: Our own Damian Almanza took top honors today. Battling cramps and ticks he easily won beating a packed field of riders. Damian now leads the series.... John Oberrieder rode hard and finished 10th in his first race of the season. Single Speed (open): Cherry pickers were out in force today. Chris got the holeshot and hung close to Bill Stolte (the cherry) until he got a flat. After a quick tire repair he gave chase again only to get another flat (need to speak to his mechanic about this). Chris ended up working his way back up to 2nd place in the end. Boys 8 and under: From start to finish Christopher Locke contolled the first round of the series. The course was a little tacky and soft, so Christpher opted for a low gear range. He was able to get the "holeshot" and slowly pulled away the entire race. This was Christophter first race of the season. Cyldesdale: Gerard Arantowicz started off slowly, but quickly took over first place and kept it the until the end. A very strong showing by Gerard. Sport Men 30 - 39: Chris Locke didn't have the same luck with his start has his son did. A 30th place start was not the ticket on the technical course. By the end of the race Chris had worked his way up to 4th place - making several enemies along the way. Sport Men 20 - 29: Mike Taylor did well to place 8th. The course was very technical and wet in places. Mike took a few spills along the way. I look for Mike to be on the podium very soon. Youth Girls: Ashley Noll wins two in a row and takes over the points lead. Cat 5's: Robe Prevost continues to do well. Takes a 5th place on Saturdays new course. Youth Girls: Ashley Noll had a great ride and won the Youth Girls class. Ashley is on a role. Cat 5's: Rob Prevost wins a spint in his first criterium. Overall placing was 6th. Cat 4's: Chris Locke did well to place 6th with 43 riders (a record turnout). He won the 3rd sprint of the day and was in the hunt the entire race. Cat 123's: Ed Noll fought hard for a top 10 placing. Watch for Ed when the seperate the 3's. Gerard Arantowicz made the trek to OK to compete in this classic event. There were close to 800 riders with Gerard placing 74th. Pics and story soon. Cat 5's : David Pitt places 6th on this demanding road race. The large hill on this course caused several packs to form making staying with the lead pack hard. Juniors : Ashley Noll win's her first road race. Cat 3's : Ed Noll finishes a strong 14th place in a tough Cat 1/2/3 class. Cat 5's : Rob had some bad luck with bike problems. Masters 30 - 39: Chris makes it 4 win's in a row at this early season triathlon. With a personal best time of 36:12 he had the 2nd best time of the day. Cat 4's : In the 4 sprints of the points race, Chris placed 1st, 2nd, 2nd and 4th for an overall finish of 2nd place. The weather was very cold and made for some tough/hard racing. David Pitt did the team proud by winning the Cat 4/5 class. David put the hammer down with about 15 min. to go and opened up a large gap - easily winning on this cold winters day.